We are pleased to offer complete event packages and wedding packages for all of your special occasions. Please get in contact with us so we can better serve you. You have the love of your life and the ring; so what happens now? IT’S PLANNING TIME! Thinking about your wedding and all that needs to be done before that special day can often evoke feelings of anxiety, stress and sometimes even fear. Not to worry, we’ve got you covered!! Our 5 tips below should help make the planning process as stress free, enjoyable and memorable as possible! 1. Hire a Wedding Planner. Yes, ok, we know that we are a bit biased when it comes to this planning tip. In all honestly, this is a vital step in your planning process. Hiring a wedding planner is much like purchasing insurance for your investment. We are there to bear the stress, and to help you through everything from colour pallets and vendor recommendations, to checklists and stains on your wedding gown. A wedding is beautiful chaos complete with a million and one moving parts, so yes something is likely going to go wrong, and it is our job to ensure that it is handled in the most professional and quickest manner. On average, it takes approximately 250 hours to plan a wedding; insane right?! Let us work the majority of those hours so you can enjoy the planning process! From Yes to I Do we will be by your side. 2. 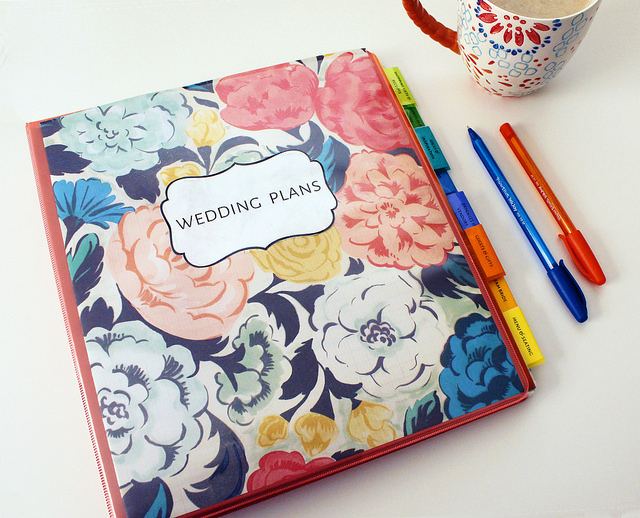 Create a Wedding Binder. It seems that these days Pinterest has become every Bride’s best friend, and we don’t blame you, there is more great ideas on there then we know what to do with! So we say Pin away, but print the Pins too! A Wedding Binder (in whatever form you create it) is the best central location for you to store your ideas, inspiration, budget, checklists, copies of vendor contracts, etc. Staying on budget and on track is so much easier if you can find all of your information in one place. 3. Pick your Top 2 Priorities. It doesn’t take much for a wedding’s budget to add up to tens of thousands of dollars. So our advice is this, sit down as a couple and each of your pick your “top two wedding priorities”. Is the food most important to you or the photographer? Does the music matter the most or is it the favours guests get to take home? Once you have determined together what your top 2 priorities are, focus your budget on those. In the end it is your special day and the majority of the money should be spent on the areas that are most important to you. 4. Be Flexible but do not Compromise your Vision. What do we mean by this? While planning your wedding you will receive countless suggestions and ideas from family members, vendors and friends alike. Our advice is listen to what they have to say, keep an open mind, but always make sure that your vision shines through in the end. A florist may unfortunately tell you that your dream flower isn’t in season/attainable for your wedding day, but they will likely have an alternative that you may end up loving even more. Like any large event, some details may need to be adjusted along the planning road, so it’s ok to be flexible and take a small detour, as long as you make it to your destination! 5. Remember the Small Details. It’s easy to get wrapped up in the “large planning details” of a wedding: booking the venues, ordering the cake and flowers, buying dresses and tuxes, etc., that we forget all about the small details that go into the wedding. Purchasing a Guest Book, buying insurance, even remembering to eat the day of your wedding! If you haven’t hired a Wedding Planner (…you probably should! ), then the best way to remember all the small details is through research and checklists. Talk to married friends, look up some checklists and refer to your Wedding Binder. No detail is too large or too small, and we wouldn’t want any of them to be forgotten! We hope that these 5 Planning tips will help make your dream wedding come to life! If you find you have questions or want some help, we are only a phone call or email away! White Willow Event Management. All rights reserved 2019.